The lastest containership to arrive on the Clyde for lay-up in Loch Striven is MAERSK BOSTON. She was the first vessel in the class of seven, all built by Volkswerft Stralsund in Gremany and delivered between May 2006 and December 2007. Sadly, the current economic situation worldwide, combined with the relatively high fuel consumption of these 29-knot ships, has led to their temporary withdrawal from service. 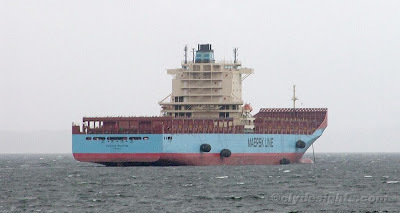 Four Yokohama fenders on MAERSK BOSTON's stanrboard side suggest that her move into Loch Striven is imminent.